How many short subject comedies did The Three Stooges make during their 1934 - 1959 tenure at Columbia Pictures? The answer to this question could be found on the Columbia Pictures page at Reel Classics. 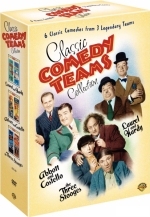 A 3-DVD boxed set of THE CLASSIC COMEDY TEAMS COLLECTION courtesy Warner Bros. Home Video. The winners will be notified by email, and prizes will be sent out shortly thereafter, following confirmation of delivery information. Special thanks to Warner Bros. Home Video for their sponsorship of this contest.